Dual Injection – Overmolding – Two Shot Molding –Soft Touch – Ergonomic Molding. Whatever you call it, we call it Molding With More. Add color, tactile feel, metallic plating, comfort grip with Viko’s processes and start adding more with your designs. Viko helps in these ways. Plenty of capacity: Dual Injection is our main business. Some shops have a press or two. We have 36 presses. 11 of them, modern dual injection presses up to 350 tons, many with integrated robotics. 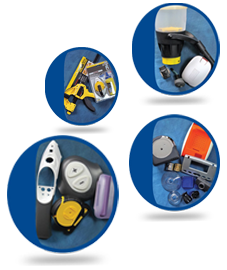 Resin Specialists: We run a full range of plastics. And we have soft touch TPE that works with them all. From Acetal and Nylon to Polypro and all the popular resins and blends in between, we know how to process them. We work closely with our TPE suppliers and have developed proprietary overmolds for exacting requirements. Tooling: If you tool it well, you run it well. Let our design team and our close association with advanced tool shops makes your great looking design into a great running job. Expert feedback and well-structured communications means you get the right assurances throughout the process. Cosmetics: Great looking parts require a special level of care. Clear parts, selective chrome plating, painted and printed parts, textures on soft-touch, all benefit from our experience making the best looking parts for our demanding customers. Experience: Since 1998 we have worked with Japanese, American and European customers who are leaders in their fields. Top engineering teams seek us out for the reliability and ease of doing business on complicated dual injection and overmolding jobs. Overmolding: While dual injection brings two kinds of plastics together, our expertise in overmolding brings our Molding With More to a higher level. We overmold onto glass and die castings, and overmold on Acetel (POM) and metal frames. Make your designs stronger, better, more robust and more profitable with precision overmolding. In Mold Labels: Molding plastics with a printed label is the advanced way to integrate permanent, durable, highly cosmetic and functional graphics into your best looking designs. Our work on programs for telecom, internet, controls, and sporting goods adds a new way to make great looking parts look better. Selective Chrome Plate: Our Vi-Chrome process combines two-shot ergonomic rubber with selective chrome. No masking lines or witness marks, the color breaks from chrome to rubber are perfect across the entire part, every time. Add hard chrome and soft touch to your important designs.